Joel Feder April 18, 2017 Comment Now! Some might say Alfa Romeo's return to the U.S. started with the 4C, but if substantial sales actually matter, it's the new 2017 Giulia that truly marks the brand's return. A moment Italian car fans have been waiting for has finally arrived, but was it worth the wait? If driving terrific driving dynamics, a gorgeous design, and a snarling exhaust note is your jam, then yes, without a doubt. 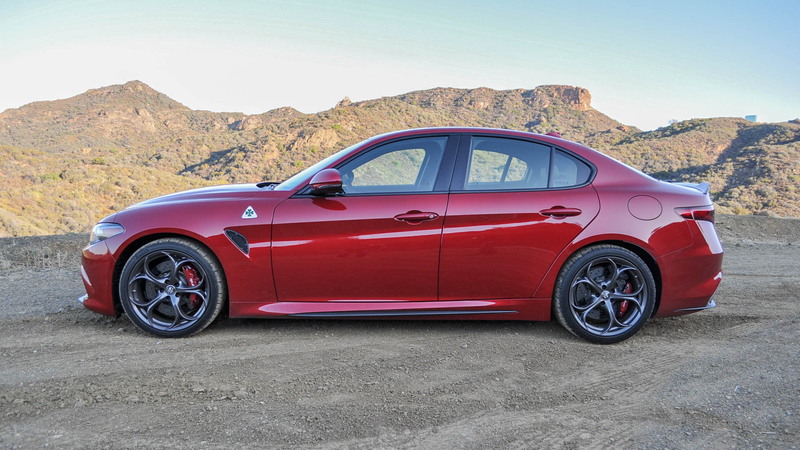 But as with most things in life, the 2017 Alfa Romeo Giulia Quadrifoglio isn't perfect, because nothing is. It has some quirks, some things that make us happy, and there is some room for improvement. 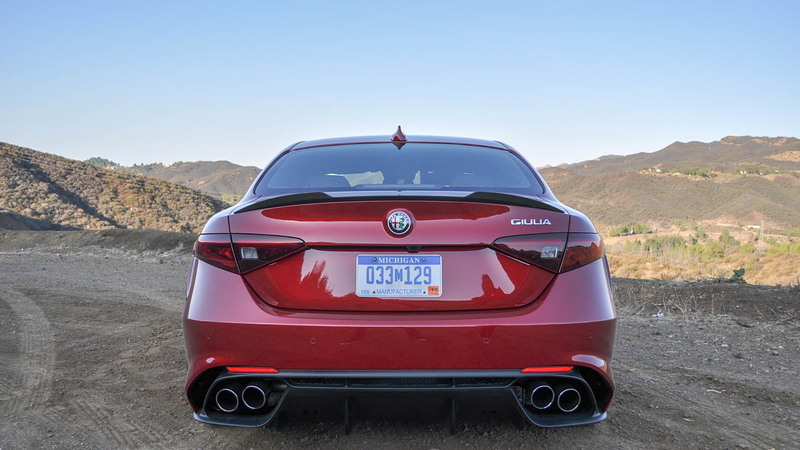 Below, you'll find 10 things you need to know about the new Alfa Romeo Giulia Quadrofoglio. It doesn't offer a manual transmission. Well, at least not in the U.S. 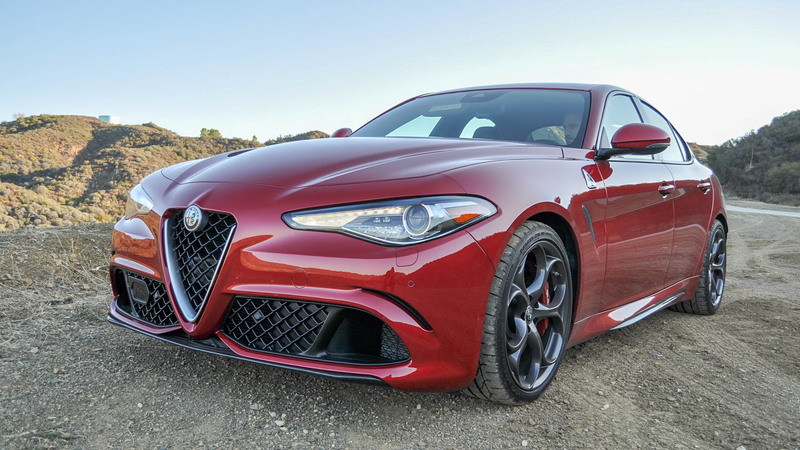 Originally, Alfa Romeo told us the Giulia Quadrifoglio would be available with a manual transmission on our shores, but then something happened. Alfa Romeo did an about face, and claimed the market for the manual transmission was too small to justify offering it here (Alfa claimed a mere one percent of buyers would even be interested in the manual option). One would think Alfa Romeo would've done its market research long before committing to bringing the manual transmission option to America. It has great steering column-mounted paddle shifters. We might not have a manual transmission option, but at least the paddle shifters are mounted correctly. Yes, you'll find them on the column as God intended. Why is this important? Because if they are mounted on the steering wheel you won't always know where they'll be as the steering wheel turns in corners. Mount them on the column and you know where each paddle is at all times. On top of that, these bad boys are big, so you will be able to reach them easily with your hands in just about any position on the steering wheel. A comfort access seat comes standard. A comfort access driver's seat moves backward to help make exiting the vehicle easier. 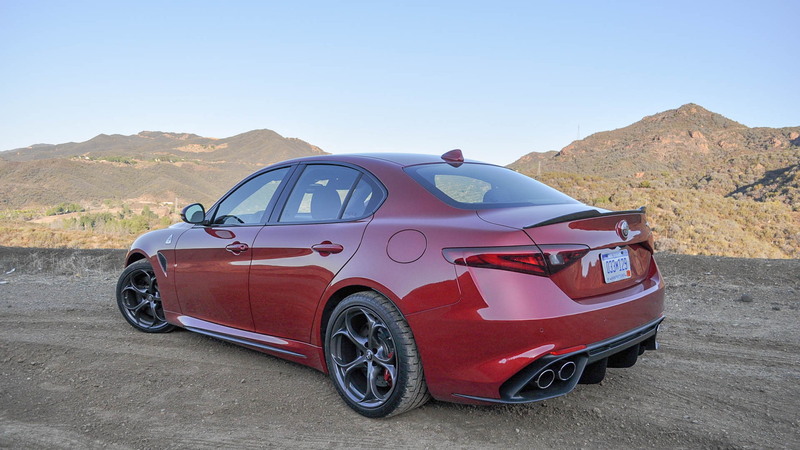 It's rare that we'd highlight this feature, but with the Alfa Romeo Giulia Quadrifoglio, we must. Why? Because not only is this feature standard, you can't turn it off. You might think this isn't a big deal, but tell that to a 3-year old behind you in a car seat who is terrified there's a seat closing in on her. Alfa Romeo told us this is being rectified with a disable feature for the 2018 model year, which will ramp up later this summer. The brakes can be hard to modulate. The Giulia Quadrifoglio has a brake-by-wire system. This, in itself, isn't particularly weird, but the fact that Alfa decided to put it into a car that's all about the experience is. When the driver presses the brake pedal it merely presses against a rubber block that simulates pedal feel while an electronic sensor is detecting pedal movement. Alfa gave the Quadrifolglio a stiffer rubber block for "more feel," but it's a weird experience. When driving in anger either on back roads or a track, the brakes are fantastic, but around town the brakes can be somewhat hard to modulate smoothly. This is especially apparent when trying to creep up to something, such as when parking in your garage. It has a trick front splitter. The Giulia Quadrifoglio has a carbon fiber front splitter that's integrated into the front bumper. It's not just there to look pretty--though it does--but rather it's part of an electronically controlled active aero system. When the car is going straight, the splitter is closed to minimize wind resistance and drag, but in corners or when braking, it opens. The result? Up to 220 pounds of downforce. People will ask you to deploy it while parked so they can see it, and the answer is no. There's no button to manually deploy the front splitter, which is a shame, as you'll likely never get to see it deployed for yourself. The V-6 engine is essentially two 3-cylinders joined together. The 2.9-liter V-6 produces 505 horsepower and 443 pound-feet of torque. It has a 90-degree V and delivers torque like an old-school turbocharged engine, with boost building until 4,000 rpm before it blasts you into the sunset. The sound is beyond interesting, and like nothing else on the road. Why? Because this V-6 is essentially two 3-cylinder engines put together much like Bentley's W-12, which is two Volkswagen VR6 engines stitched together. What's more, this Alfa V-6 doesn't have a balance shaft like most other V-6 engines, this too contributes to that wondrous sound emitting from the quad exhaust pipes. It takes a minimum of two clicks to change to your favorite radio station. If you're in the infotainment system's main menu, it takes a minimum of scrolling and then at least three clicks of the controller to select a radio preset. Happen to have the infotainment screen on the radio view? It'll still requires a minimum of two clicks to select a new preset. The buttons on the steering wheel don't change between your presets; instead they change to the next station. If you change radio stations every few songs, this can become quite annoying. Most cars don't encourage you to drive with the transmission in manual mode, but the Giulia Quadrifoglio does when put it into Race mode. It claims this will provide you with the best experience. 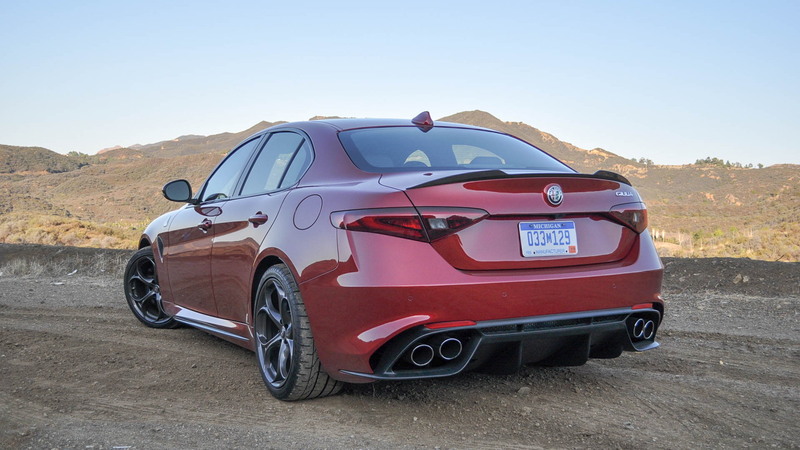 Race mode also automatically turns off all the safety systems (within reason--you aren't about to lose anti-lock brakes), so you can slide the Giulia sideways. This is also the only way to run the exhaust system with the electronic baffles open at all times for that extra special noise. We wish you could automatically open those without fully disengaging the safety systems. The rear seat isn't bad. This isn't a large car, and that means the rear seat isn't exactly huge. That said, at 5-foot 10-inches, I fit just fine behind myself with plenty of room for my knees, legs, and head. The real issue is getting in and out. The rear door opening is rather small, making ingress and egress rather difficult. Few cars have steering that is this brilliant in today's marketplace. With a lightning quick 11.8:1 ratio, the smallest of inputs make large changes. Taking a clover leaf on the highway? You'll barely need to turn the steering wheel a quarter turn. Bonus: You're going to want one. I wouldn't recommend driving a Giulia Quadrifoglio unless you plan on buying one. Why? You'll want one, badly. It has feel to go with its performance. We wish the Germans were still building their sport sedans like that. Sure, there's the question as to how reliable it'll be, but that's almost part of the charm, right?